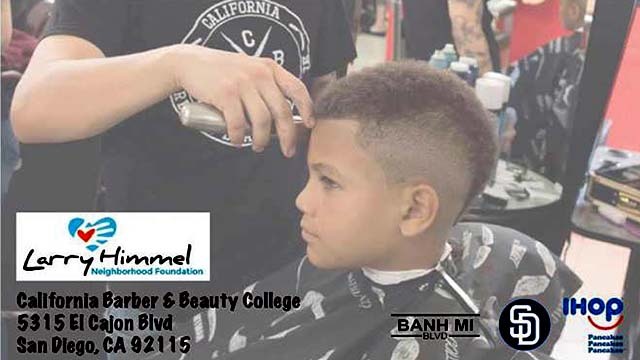 Children under 18 can get free haircuts Saturday — and possibly San Diego Padres tickets — thanks to the third annual Back-to-School Haircut Drive hosted by the Larry Himmel Neighborhood Foundation. The first 50 kids attending the event at the California Barber & Beauty College will receive a pair of San Diego Padres tickets, organizers said. Free school supplies and passes to other local theme parks also are being offered. Free haircuts via Larry Himmel Neighborhood Foundation. Image via foundation. Saturday’s event starts at 10 a.m. at the college, 5315 El Cajon Blvd, not far from Horace Mann Middle School. IHOP is donating breakfast to all attendees as well. Last year, 300 were shorn. The foundation is named for Larry Himmel, the San Diego television reporter and humorist known for his “At Large” commentaries. He died in November 2014 from cancer at the age of 68. The foundation’s officers include Himmel’s son, Miles.